The Veterans Memorial Bridge, formerly known as the Detroit-Superior of High Level Bridge, is an unusual and outstanding example of early twentieth-century bridge engineering. The double decked structure spans the Cuyahoga River Valley adjacent to downtown Cleveland, Ohio and consists of twelve concrete arch approach spans with lengths varying between 80 feet and 180 feet, and a 591-foot long steel arch main river span. The bridge was constructed as a replacement for the old Superior Viaduct, which spanned the Cuyahoga River immediately north of the Detroit-Superior Bridge. The upper deck of the structure was designed to carry highway and pedestrian traffic whereas the lower deck was designed for streetcar traffic. The approaches to the lower deck of the structure included subway tunnels and passenger stations for the streetcars. The first traffic crossed the upper deck of the new bridge in November 1917, and the first streetcars crossed the lower deck in December 1917. 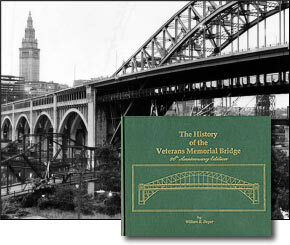 The History of the Veterans Memorial Bridge: 90th Anniversary Edition by William Beyer documents the history of the original construction of the bridge and the two major rehabilitations - the first was done from 1967 to 1969 and the second was done from 1995 to 1997. Some technical information is included, which may be of interest to some readers. However, the major emphasis of the book is the documentation of the history of the bridge and the surrounding community with photographs. The photographs offer a unique opportunity to glimpse into previous eras in Cleveland. It is hoped that the reader will enjoy a journey through the planning, design, construction and rehabilitation of this structure - and develop an understanding and appreciation for the importance of maintaining and, whenever feasible, preserving notable structures such as the Detroit-Superior Bridge, which remain today. Posted 2009-10-19 15:13:35 by Tracy_Kemp. 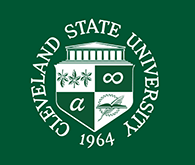 Categories: Cleveland Memory, Library News.